The V-Lock® functionality is incorporated into the Crowning system (with Hydraulic Clamping) through special designed clamping pins. The V-Lock® makes it possible to further improve the positioning of bottom tools. 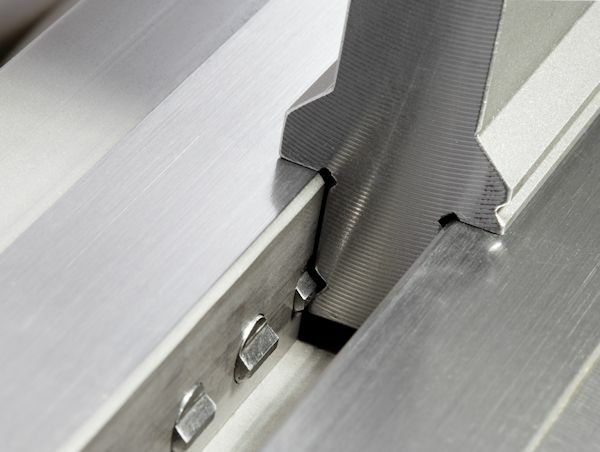 A groove at the back of the tool is used to automatically align bottom tools and firmly clamp them in place. This prevents tools from being lifted during the bending process. Existing bottom tools without V-Lock® functionality can also be used on this Crowning system.